Recipe Readers, Spudnuts, & Braille: Seek and ye shall find is the motto today. We are excited to report, we found Fanny Farmer’s cookbook in Braille, thanks to Mike Hudson, Curator at the American Printing House for the Blind’s Museum, in Louisville, KY. APH, founded in 1858, is adjacent to the Kentucky School for the Blind. In addition to the press, there’s a museum and the APH M. C. Migel Library, an important disability history library collection mostly focused on the visually impaired. APH first published Fanny Farmer’s cookbook—what they called the Junior Edition– in 1961, for $5.10. Nowadays a school might buy the 1990 edition, 3,000 braille pages–$642 per book. Like most of the APH cookbooks in braille, this work is typically used in the classroom. We had to find this Book of Potato Cookery! And, yes, we discovered, the 1918 edition, http://bit.ly/2mSsL45 . Our image is a mash up, featuring the original frontispiece and our favorite recipe: mashed potato doughnuts. Cooking any form of doughnuts requires a brave cook, space, and a vat of burbling hot cooking oil. And, if that weren’t enough, how that vat did its work on a coal, wood, or gas range of the types commonly found in 1918—well our imagination is being stretched here. By 1930, the stoves had become a bit more modern. We could have stopped there, but we needed to know, what did anyone else think about making doughnuts out of mashed potatoes? With that question, we landed here in the SPUDNUTS, USA, Wikipedia article: http://bit.ly/2DlCYQA. Yes, 1918 is earlier than anything mentioned inside that piece, but perhaps Spudnut Shops were a Mary Wade legacy? 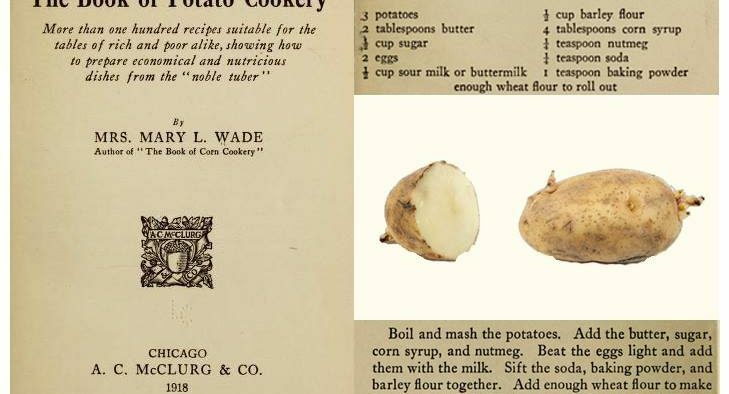 And then there is the mystery potato recipe: On page 22, of Wade’s 1918 edition, check out the potato and peanut butter combo. Initially, we thought, ugh! But then we wondered, if this recipe used yams and peanuts and the cook came from the US South, west or north Africa? maybe there’s something there. Anyone ever eat potatoes with peanut butter? Image: A mashup. 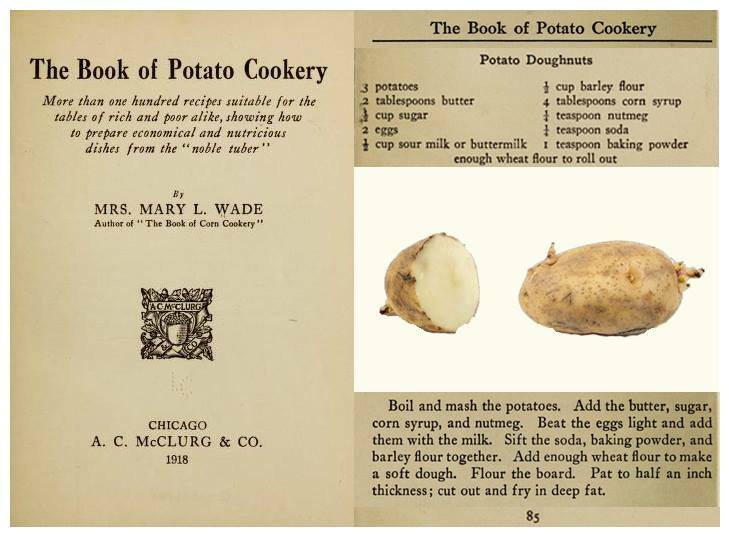 Frontispiece of The Book of Potato Cookery, Mary Wade, 1918 with a recipe for potato doughnuts, including a picture of a whole and a cut potato, plus the instructions. The recipe is on page 85 of this edition.